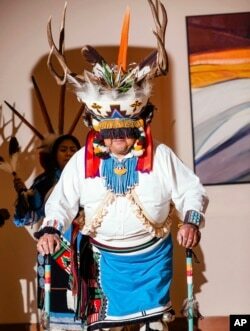 The Arizona tribes now have a new place to look: the state’s wildlife agency. Under a new program, they can ask the state Game and Fish Department for animals that have died from illegal hunting or natural causes, or after being hit by a motor vehicle. “It’s all just … a collection of what we find out in the field,” said Jon Cooley, the department’s contact with over 20 tribes. In this Thursday, March 28, 2019 photo, a tortoise shell is seen from Arizona's desert region. Arizona wildlife officials are on the lookout for bear, bison, badger and other carcasses for Native Americans' religious and cultural use. 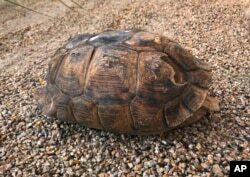 In Arizona, the objects highest in demand are tortoise shells. Also on the tribes’ lists are mountain lions, bison, deer, antelope, and game birds like turkeys. The requests are somewhat detailed, so Cooley said the agency does not want the public donating animals or gathering them from the roadside. One animal Game and Fish employees will not store is a bear that has been shot with sleeping drugs. The chemicals could remain in the body and some tribes generally won’t take animals that have been drugged, Cooley said. While the Navajo and Hopi have received the most material so far, the plan is to include tribes in other states if Arizona tribes don’t need what’s there. Tribes in California, Nevada, Utah, Colorado and parts of Texas and Oklahoma will also be able to get animal parts from the storehouse, Cooley said. 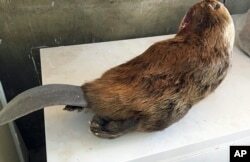 In this Thursday, March 28, 2019 photo, a beaver is seen in a freezer at the Arizona Game and Fish Department offices in Pinetop, Ariz. Arizona wildlife officials are on the lookout for bear, bison, badger and other carcasses for Native Americans. The Native American Fish and Wildlife Society brought up the idea of buying freezers at one of its conferences. The society would give them to the Arizona Game and Fish Department to store animals. “Everyone was on board; everyone was in support of it,” said Darren Talayumptewa, who sits on the society’s board of directors. The society purchased four freezers for use in Arizona. "In the past, if the tribes had seen something dead, if it was roadkill, they would try to see how they could obtain it," He said that in the past " … there was really no process for Native Americans obtaining various parts."